Euratex was founded in 1995 upon merger of three European Commercial Associations, namely COMITEXTIL, ECLA and ELTAC. Euratex is the only European organization representing the Textile and Apparel Industry before European Union and International Authorities. Turkey commenced representing the Turkish textiles and apparel industry in Euratex with 4 members from the beginning of 2002 on with TGSD/IHKIB in apparels and ITHIB/TUTSIS for textiles. 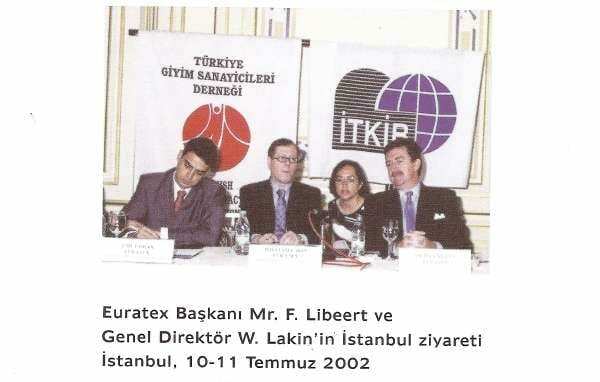 Also, Umut Oran was appointed to be the president of Apparel industry in EURATEX for representation of European apparel industry on december 5th, 2001, while he was serving as President of TGSD. Euratex, constituted by the national and industrial level NGOs of the European Textiles, Apparel, Processing, Cotton, Machinery and Retail Sales industries provides consultancy services to the Commission of European Union in all aspects related with the industry, with an effective role in the resolutions by the commission of European Union that have an impact on the industry. These four organizations representing the Turkish Apparel and Textiles Industry in Europe have the opportunity to have an impact on the resolutions thanks to full membership in Euratex. Euratex both watches for benefits of its members and organizational structure and international responsibilities of the European Union. Euratex acts on behalf of the European apparel and textiles industries together with the european organizations for the resolutions and regulations that have an impact on the whole industry. The subjects are generally commercial and industrial policies, research and development, environment and social affairs. Euratex works for easing the integration process defined in the GATT Textiles and Apparel Agreement dated 1994 and empowering the international competence of the industry.